Linux tip: How to set Winamp Presets in XMMS Music Player ? XMMS is a full fledged Winamp like MP3 player for Linux. Althought it lacks many functionalities that are available in Winamp, but XMMS looks very similar to Winamp nonetheless. Since XMMS does not come with built in presets, we thought we would use the default WINAMP presets in XMMS. 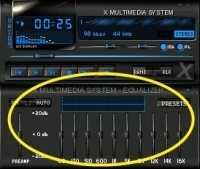 In this article we will tell you how to go about setting up Winamp presets in XMMS Music Player. 2. Download this file: eq.preset and copy it to the .xmms directory. This file contains all the winamp preset settings you should not rename this file in the .xmms directory. This means you should have the file eq.preset right in your .xmms directory.